Sweetness is the most pleasurable taste — it’s the taste we crave from birth well into adulthood. In the United States, the world’s largest consumer of sweeteners, chefs and their customers embrace the sweetness found in everything from ripe fruits and honey to vegetables and alternative sweeteners. 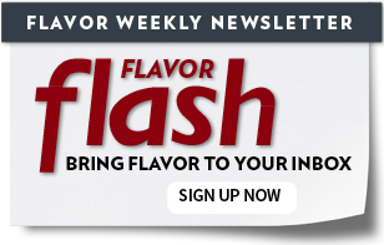 In fact, sweet-forward flavor profiles were preferred by a whopping 81 percent of the participants in Culinary Visions’ 2012 Flavor Focus panel. “Sweetness has a great effect on balance of flavor,” says Robin Trumm, senior flavorist at Firmenich, a flavor and fragrance manufacturer. She says cinnamon, for example, can be “very bitter and pungent,” but when sugar is added, one’s perception of its flavor changes. Aromas also play a large role in flavor perception. The right combination will enhance the perception of sweetness, she says. Such inherently sweet smells as brown sugar or caramel, or those with a sweet association like cinnamon or vanilla, elevate our appreciation of the role sweetness plays with flavor, she adds. “When formulating with sweetness, you have more room to work with acid, salt, bitter and umami tastes,” says Chicago-based consulting chef Charlie Baggs. He says sweetness is a great balancer for all other tastes. But sweetness, as with salt and other tastes, should be used judiciously. People can develop higher and higher thresholds for tasting sweetness. The less sweet food we eat, “the more enhanced our ability to recognize sweetness becomes,” says Baggs. Seasonal produce at its peak is naturally sweet and among the first ingredients contemporary chefs choose to develop a subtle sweet flavor profile in a savory dish. “There are variations of sweetness — tomato sweet or banana sweet, for example,” explains chef Tyler Anderson of Millwright’s Restaurant in Simsbury, Conn. He mentally evaluates the pH of a fruit or vegetable before using it in an entrée. In a late summer appetizer, when the tomatoes are very sweet, he pairs them with whipped ricotta, pickled strawberries and dots of rhubarb purée to mellow some of the sweetness. “Just a bit of sweetness does the same thing as astringency or sour does,” he notes. Anderson uses sweetness to lighten a rich entrée, combining pork loin and belly with grilled plums, for example. Citrus fruit, pomegranate seeds and juicy grapes add a natural sweet-tart note that counterbalances salty and fatty notes. Grapes, says Courtney Romano, consultant to the California Table Grape Commission, are a good example of the type of sophisticated natural sweetness chefs seek. Grapes are able to cut through the fattiness of certain foods (cheese, oils, duck, etc. ), as well as the saltiness (prosciutto, cheese). The juicy characteristic of the grape, says Romano, is also a “refreshing foil” in hot, spicy curries. Awerbuch says that using produce to balance savory with sweet is traditional in many cultures. Chutney may not be common in French cuisine, but a confit or cooked-down fruit would be. The challenge when creating balance with sweet elements is avoiding repetition or merely adding salt or a hot pepper. “More thought goes into creating flavor balance that is unexpected, such as apples or pomegranate paired with smoked salmon,” she says. For her, developing depth of flavor is key to creating balance when working with sweet elements in savory preparations. Sweet-sour flavors are the new tools in the chef’s sugary taste arsenal, from vinegars that skew sweet to gastrique to pickled fruit. Such products as trendy Minus 8 ice-wine vinegar from Canada “already have that balance between sweet and sour that really helps carry through the rest of the food,” says Firmenich TechnoChef Noah Michaels. He suggests using such vinegars in a glaze, as an accent or in a sauce as palate cleansers. Chef Ris Lacoste of Ris Restaurant in Washington, D.C., uses sweet white port in a ginger-caramel vinaigrette served with crusted seared sea scallops. These sweet and tart elements make it relatively easy to dress up a vinaigrette or finishing sauce. Lacoste is also a fan of mostarda for a sweet-sour element. Made from candied fruit preserved in a pungent syrup spiked with powdered mustard, mostarda brings a nice complement to rich meaty flavors like ham, lamb or braised poultry. She makes a grilled peach mostarda to accompany a smoked ham hock terrine. Closely related is agrodolce, a sweet-and-sour condiment or pickle made by cooking vegetables like onions with sugar and vinegar. These condiments add that spark to rich, aromatic dishes and even to whole-grain or bean preparations. Versatile gastrique, the classic French sauce made from a reduction of vinegar and caramelized sugar, is replacing balsamic reduction on many menus, notes Awerbuch. Citrus juice, molasses or agave can be used to change the flavor profile of the sauce. “An intense gastrique can add that craveable flair needed to take a dish over the top,” says Baggs, noting that caramelizing the sugars also adds complexity. Awerbuch sees pickling as another means to bring unique sweetness to savory dishes. “The pickling liquids we make tend to be very potent, with specific ingredients such as Asian pickled plums, star anise, ginger, rice-wine vinegar and honey.” Pickling liquids may also reflect seasonal flavors, she notes. Her fall peaches in red wine, cinnamon and clove pickling liquid may even be served over ice cream or bread pudding. At Atlanta’s Empire State South, sweet and sour pantry items accent the menu, says chef Ryan Smith. Preserved citrus and pickled blueberries are among the fruits put up by the chef for use year round. Berry-based sweetness lends barbecue sauce distinct appeal. At The Palace Café in New Orleans, a Ponchatoula strawberry barbecue sauce accompanies braised pork shank while blueberry-chicory barbecue sauce accents the pecan-smoked duck. Neither puckery nor cloying, contemporary sweet-and-sour flavor profiles are refreshing and modern. Awerbuch follows a similar flavor inspiration with the savory brûlées at Abigail Kirsch. In such profiles as foie gras, wild mushroom or tomato-basil, the brûlées have an element of surprise and a “Wow!” factor, she says. Customers appreciate the subtlety of toned-down sweetness alongside the rich, savory flavors. Similarly, moderating sweetness with a touch of char adds character to a dish. “When you caramelize sugar, you create a hundred nuances of flavor,” says chef Baggs. He notes that chain restaurants are getting more sophisticated in cooking techniques, caramelizing sugars, for example, and pairing on-trend sweet potatoes with caramelized onions. At Empire State South, chef Smith likes to caramelize and burn sugar to add flavor complexity. He serves a duck terrine on a base of Burnt Bourbon Mustard. The fiery housemade mustard is smeared on the plate, sprinkled with sugar, then burned with a torch. The flavor comes in waves of sweetness followed by hot, then bitter. Smith is careful to avoid tipping the too-sweet scale. “It is easy to go overboard with sweetness,” he cautions. Candied nuts and seeds bring a heightened texture and a caramel note to a wide range of dishes. In a salad, candied pecans or walnuts tame the bitterness in blue cheese and endive, and bring out sweet notes in fruit and vegetables. In Indian, Moroccan or Mexican cuisines, candied cumin, coriander or pumpkin seeds add a pop of texture and sweetness to savory stews. Just as sweetness has crept onto the savory side of the menu, so too has saltiness entered the realm of dessert. The summer launch of Burger King’s Bacon Sundae shows the mass popularity of bacon. But, notes Michaels, it also signals a crossover acceptance of salty ingredients in sweets, a trend that he says gained traction with the publication of Sucré-Salé, chef Pierre Gagnaire’s book on the subject. Awerbuch has seen more consumer acceptance and more menu prevalence of sweet-savory combos. Customers once shied away from the unexpected, she says, but with consumer education and exposure to new ingredients through food media, the market is more receptive to words like “caramelized” to describe a savory. Part of the artisan-everything trend, making soft drinks in-house allows restaurateurs to control their sweetness message and give a seasonal spin to what’s on tap. Quality housemade soft drinks top the National Restaurant Association’s 2012 Restaurant Industry Forecast. Independent and chain restaurants alike are making more drinks themselves, from seasonal fruit lemonade to root beer. Bartenders looking for ways to put a signature spin on their cocktails rely on such sodas as well as syrups and infusions. Brent Bushong II, maître d’ in charge of the wine and spirits program at Millwright’s, believes in “clean, true flavors” in cocktails, which are often paired with the chef’s tasting menus. “We make the sweetness natural,” he says, which reflects the restaurant’s farm-to-fork philosophy. With the rise of the South as America’s culinary capital, sorghum is also getting more play. Chef Smith at Empire State South sources a light amber sorghum that is less bitter than traditional sorghum. Chef Baggs notes that local honey, region-identified maple syrups and agave are great sources of natural, on-trend sweetness, all the while adding distinction to the menu. “Menuing unique ingredients is a way to set yourself apart — adding agave makes it sounds a bit sophisticated,” he says. Today chefs are blending sweet, bitter, sour and salty tastes in various combinations that may be balanced or sharply contrasting. As palates have become more sophisticated, sweetness remains a key note to creating desirable flavor profiles.